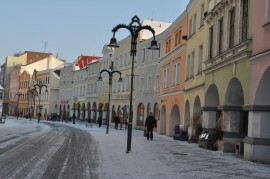 These houses are located in present Hobzíkova Street. They come from the second half of the 16th century and they are mainly of Rennaisance style. Some of they have been modified in a Baroque and Empire style, the rest is in a Classicist one. The houses underwent significant modifications in the second half of the 20th century. In legal-brewing houses used to live local rich citizens, who were given the right to brew and sell beer, but only in their houses and on days given. Beside the brewery right, these people were also allowed to pour the wine. The houses were marked with a chain fixed to the door leading to the “Mázhauz” ( a large groundfloor room). Bakers, barbers, tailors, mayors or councilors also used to live in the middle class houses. Under the houses arcade, commodities were sold, such as salt, being imported from Poland or Austria. People allowed to pour the wine had also the right to arrange a musical evenings. The music was run by the local piper and his musicians – professionals. As time went, many complaints concerning the quality of beer occurred from the side of citizens.For attraction, pub owners tempted the guests with various attractions. At the turn of the 18th and 19th century, with beer of a poor quality, people found a new harbour in a newly built spa by the Opava river. The spa was called “Benátky”, thank to the ferrous mineral water that sprang here. Such a strong competition led the pub owners to the act. One night they filled up the spring for good. 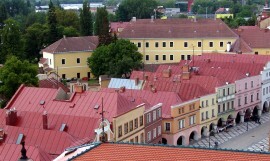 Later the brewers agreed on force joining and this led to the first beer brewery in Krnov. 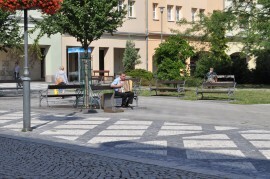 A pedestrian zone, connecting the Main square separated by the town hall and the bank, leads around the middle class houses. During hot days this area is very popular with citizens and tourists. There are plenty of cafés and confectioneries. If you are lucky, sitting with a cup of coffee can get better with „Josef a Josef“ with their harmonica and clarinet playing. Virtual Tour to view here. 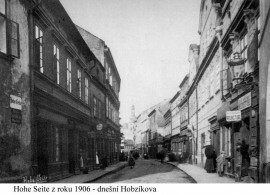 Burgher and brewing houses are accessible, as at present in them are cafes and shops.